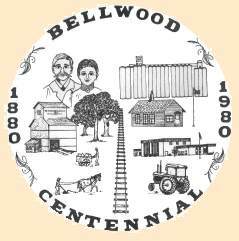 All aspects of the Bellwood community throughout its first 100 years have been exemplified in the official Bellwood Centennial crest which was designed by Mike Wilson, an eighth grader at the Bellwood District 3-R School. The plow eventually gave way to the modern tractor. The old grain elevator has been replaced by a larger, newer, ever-expanding facility serving the Bellwood trade area. The old mail cart was put to rest when the post office, pictured in the three o'clock position, was modernized. The school is the center of many community activities. 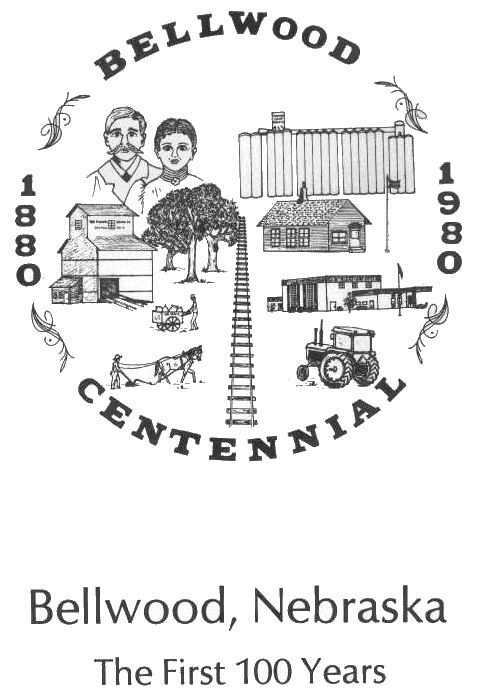 The Bellwood community will be celebrating its 100th anniversary on July 11, 12 and 13. "Twas a sea of grass where the settlers stopped. They broke the sod and planted their crops. They founded a town when the railroad came. And built elevators to ship out their grain. Which allowed them to irrigate and get bountiful yields. Turned out to be a Garden of Eden. The above poem was written by Robert M. Bell, Sr., and is printed on the back of our Commemorative Centennial Plate. The face of the plate is inscribed with the Bellwood Crest to complete the heritage of our town. It was designed by Mike Wilson. 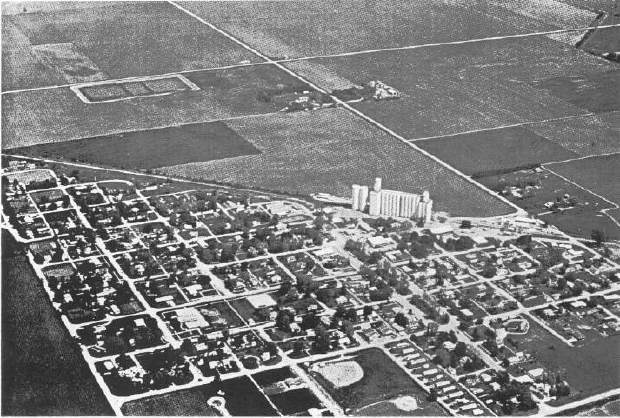 Aerial view of Bellwood, Nebraska.